The Crown Hotel Inn Hotel is thought to be the oldest Dorset Inn . This former coaching inn supposedly there are several spirits visiting this hotel. Frequently seen is an 18th Century lady, who is dressed in black crinoline. She has been glimpsed moving around the 1st floor of the hotel. The Lady in Black has been observed by hotel staff entering rooms and vanishing. Sometimes the rustle of her distinctive black dress has been heard around the 1st floor. The reputed spiritual residences of the Grosvenor are ghostly monks and a ‘Grey Lady’. Other sightings have included an apparition of a young girl moving around the rooms, sometimes playfully pulling back guests bed sheets. The Phantom Grey Lady’ is thought to be an apparition of a 16th century Nun, fleeing persecution from the nearby Abbey. She is heard and sometimes glimpsed in the hallways on the hotel’s upper floors. Is she returning searching for something? The oldest part of this former coaching inn is the cellar and the haunt of the hooded monks. This is where apparitions of hooded monks have been caught in people’s peripheral vision, Shadowy visons that disappear as quickly as they appear. The fact that the site has been continually occupied for over 1000 years, leads some to believe the Grosvenor Hotel is very receptive to paranormal activity. 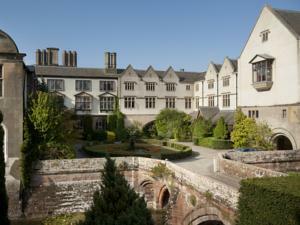 Some even consider it as one of the most haunted hotels in the UK. The Langtry Manor Hotel combines original charm with modern luxury. So much so that The Guardian newspaper called the Langtry Manor “the best hotel in Bournemouth”. It is also a good wedding venue. Could the reported grey shadow really be the ghost of Edward VII’s mistress, Lillie Langtry? Lillie is said to still wander around the Langtry Manor Hotel? Formerly the Langtry Lodge it was the home to the Lord of Derby. In 1877 King Edward VII built the manor as a cosy love nest for Lillie. This was an ideal place for their liaisons. Lilly Langtry died 12the February 1929. She is buried on the island of Jersey. It would seem she still enjoys the ambience of the Langtry Manor Hotel. This property was rumoured to be haunted by a tall slim lady that appeared to be wearing high heels. Was it this lady that was responsible for waking visitors during the night removing their bed sheets and pushing over a bedside table?